Our Yuma location is a Warranty Service Agent serving La Paz and Yuma counties of Arizona, as well as western Riverside and Imperial Counties of California. If you are located across the border of Imperial County, we are here to service you as well. From our location at 702 E. 39th Place, Suite 2, our CFESA Certified Technicians are well positioned to provide expert commercial oven and restaurant equipment repair and services on the brands you have. With 24 hour 365 days of the year coverage, we have your back! The Yuma team is committed to their partnership with you to ensure your food equipment along with your HVAC, Refrigeration and ware-washing needs are taken care of. For more information, contact us at (928) 299-7001, or email YumaDispatch@GP-ServiceDirect.com. What you can expect from the Yuma General Parts Group team. Custom Maintenance & Repair Service – What’s the phrase – ‘An ounce of prevention is worth a pound of cure’. Those are words we live by when we develop service plans that are designed to care for the equipment you have and keep your operation running. Small Equipment Repair – If you have commercial kitchen appliances that need repair and are small enough to carry, drop them off at our office. Our authorized technicians will work on them in our on-site repair shop and let you know what they identify the issue to be. 90-day warranty – Our commitment to the food service industry is evident in our 90-day labor warranty. Manufacturer Warranty Repair – Appointed as an Authorized Parts Distributor and Warranty Service Agent for many major manufactures, we are able to conduct the necessary work when needed. O.E.M. Replacement Parts – We carry a vast array of O.E.M. replacement food service equipment parts to support our technicians. All parts are also available on our e-catalog at GP-PartsDirect.com, for those who prefer to repair their own. Pick your part up at our Yuma location and ground shipping is free. Flexible Schedule – We understand your operation is very busy which is why we schedule being on premise when it works for you. 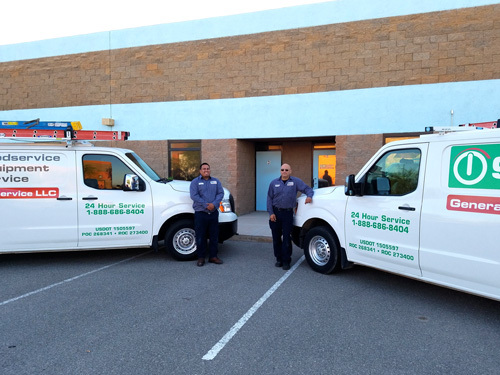 Equipment Installations – When the time comes to replace a piece of equipment or add additional to your operation, we are the team to call. Our certified technicians are able to install most brands. Support Through Technology – General Parts Group’s proprietary Automatic Status Update System provides updates on the progress of your commercial kitchen service. Online Information – Account service history, lifecycle cost reports and more are available when you want it via our Customer Portal located on our website. Click here to request access.